I'm wondering (since it just happened to me), is it possible to "cancel" ("undo", "delete", "retract", whatever) a flag I just raised if I misclicked it, so the mods won't waste time? I looked everywhere, but I can't find such a feature. This is now completed and as of August 2016, live network-wide. Note that if you're a moderator (and thus your flags are authoritative), there's no retracting. Also, close flags get converted into close votes if you have enough rep, and can be retracted through the existing "retract close vote" mechanism. It works for Questions and Answers. To retract a flag, click the flag link again and the button should become Retract Flag. This does not work for comments as the issue of mis-flagging mainly happens on Questions & Answers, unless there is a big demand for Comment-flag-retraction as well. You also cannot retract an active flag for moderator attention if the post has been deleted and you don't have enough rep to see deleted posts. I would love to see this feature, although I don't think that misclicking is the real selling point here. As I've already stated in a comment to Calebs answer, the use-case for me is more frequently that other events than my flag being evaluated make the flag irrelevant. The most frequent example is that the flagged post is edited so that it is now of a quality that would not cause me to flag it in the first place. I know that the reviewers are supposed to see the post as it was when it was flagged, but if it is good now, why not let me retract the flag as events have rendered it a waste of time? Here is one such example, where the code was not added (or invisible?) when I flagged it, but there and visible now. The other, rare, example I've just experienced a few times was after I reviewed a late answer and I ended up placing multiple similar flags - each in essence a superset of the previous as I found out more, and each time I would have liked to retract the previous flag as the newer would provide a more complete picture. I realise I should probably have waited until I was sure I had 'everything' until placing my flag, but I rarely go deeper once I've placed a flag - especially not from the review queue. You can go to http://www.SomeCompany.com/TheCoolProduct.html - this tool can do exactly what you need. (Disclaimer: I work at SomeCompany). The domain of the question was not for me, so I couldn't really tell whether the answer was useful. The user posting didn't provide enough effort for me to automatically accept this as being within these limits, but the user was also new, so a red spam flag might be too harsh. I flagged it for moderator attention and explained why. 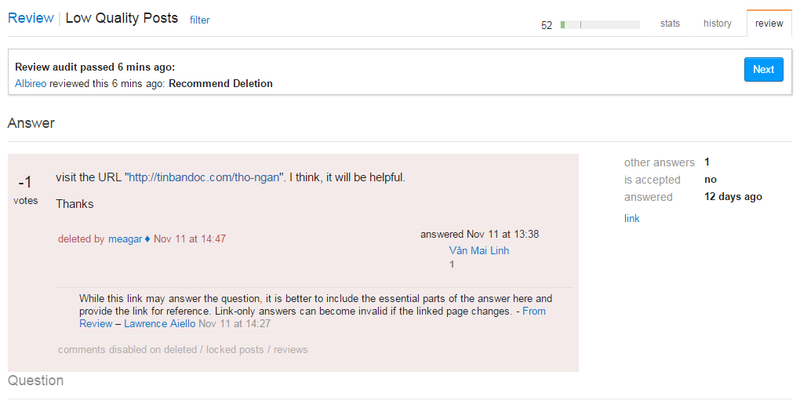 Then I got curious, looked some more at the user, and found that all 5 answers he had provided were of the same type. So I flagged one of the other answers and explained the new findings. As mentioned, I would have liked to retract the original flag at this point. A few minutes later I got more curious and tried searching on SO for SomeCompany. This turned up yet another user with few answers, similar name and similar style answer. So I flagged that as well. For documentation I've attached a screenshot. As the third flag is still active, I've anonymized the question and the user there as well as my reasons in all three flags. First of all, it's no big deal if you flag inappropriately "every now and then". (As long as it is not a chronic misunderstanding of how the flagging system works). To answer your question, you can't "take back" a flag. As for your feature request I don't think it is a common enough mistake to make this feature available, plus it might be an expensive operation (not sure about that one). You can't "take back" a flag. It is a much requested feature, but it has never been implemented. After I've discovered that flagging is unreversable in all cases (and that includes when the flagged text has been edited), I've been much more reluctant to flag. I flag spam and new questions posted as answers, as those are usually obvious, but I never flag anything that requires a value call, or where there is a remote possibility that editing by the OP or the community may change things. While some say it doesn't matter, I just don't like the aesthetics of having declined or disputed flags listed on my profile page, so I rarely use the flag. If my reaction is typical, it may be that this is the intended behaviour. I.e. that the designers of this site want the threshold for flagging to be high, so that only clear cut transgressions are flagged. If it is inteded to condition behaviour in this way, there is probably no point in requesting this feature to be added. Note that even if this used option contained some sub options, clicking it shouldn't lead to sub options, but just provide an ability to retract this type of flag. 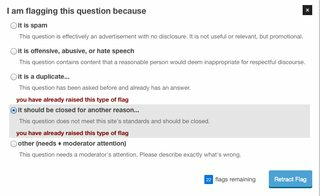 I completely agree, and if you're someone like me (and like many of us) who goes back and checks on their pending flags, we could absolutely make moderator's lives easier by retracting our flags. I would have retracted my flag on all of these. Instead, we just clutter the queue for even longer and make more work for moderators. One thing that CMs and moderators talk about time and time again is that moderators should be able to process hundreds or thousands of flags quickly. This ability is important because it provides a mechanism to remove moderator roadblocks that slow them down / waste time, because they have to look at the revision history, otherwise they can make mistakes. In other words, a revised post selects for a category of the most time consuming, brain involving flag situations, and taking steps to help with this category can help a lot. Raising a flag takes a minimum of several sequential clicks. 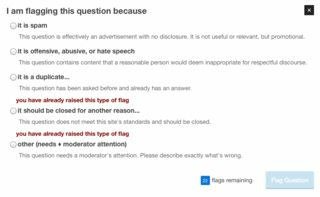 On the two sites I moderate, I have yet to see a flag raised by pure click error. I think any feature trying to mitigate this problem will just add complexity and confusion to an already well oiled machine. Additionally, since flags are inherently something that requires the flag handler to exerciser judgement on, an occasional miss-flag will just be dismissed or declined. This shouldn't be a big deal for occasional mistakes. Not the answer you're looking for? 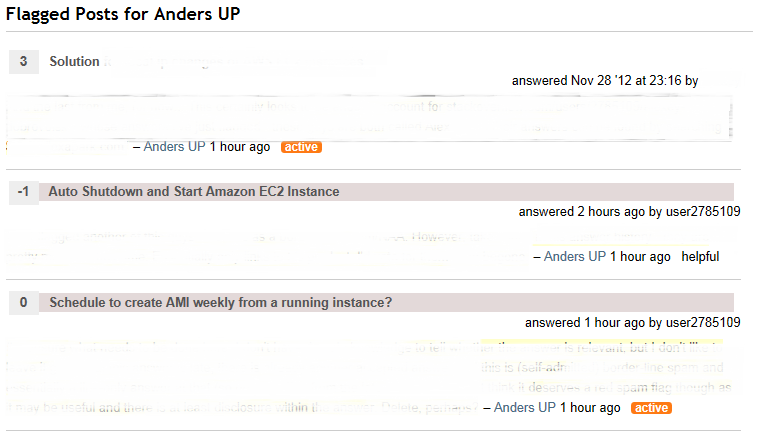 Browse other questions tagged feature-request status-completed flags undo retracted-flags . Flag removal: Is it possible to remove your flag or otherwise indicate it should be unflagged? Should there be an option to revoke not yet reviewed flags? How to unflag a comment when it was flagged by mistake? Why is there no way to cancel a “flag” request?